For the salsa, combine all ingredients together and set aside at room temperature. For the fish, combine the Cajun spice, olive oil and seasoning and brush before brushing the mixture over the fish. Pre heat the Stainless Steel grill, and cook the fish until it begins to flake, (approx. 6-10 minutes). Once cooked flake slightly. 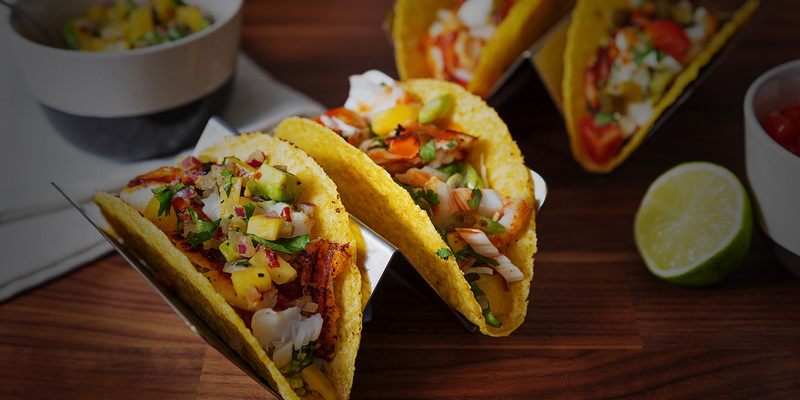 To build the tacos, start with the taco shell and put some sliced cabbage in the bottom, followed by a little soured cream, then spoon a little of the salsa over the top followed by some of the flaked fish. Top with some more salsa and soured cream and finish with some chipotle sauce, fresh chopped coriander and a squeeze of lime.